The entertainment district of Gion in Kyoto as seen from the steps of Yasaka Shrine. The street is flanked with a multitude of teahouses where customers could enjoy food, dance and music. The tower on the left is part of Yasaka Elementary School (弥栄小学校), established in 1869 (Meiji 2). The school’s tower was used as a lookout and to mark the time, every two hours a drum inside the lookout was sounded. Electricity poles already line the street. Kyoto’s electricity company, Kyoto Dento Gaisha (京都電灯会社), started operations in July 1889 (Meiji 22), so this photograph was taken after this date. Right in front of the pole next to Yasaka Elementary School, a gaslight can also be seen. Kyoto is rapidly modernizing itself. Gion’s Shijo-dori was originally only about 5.5 meters wide. 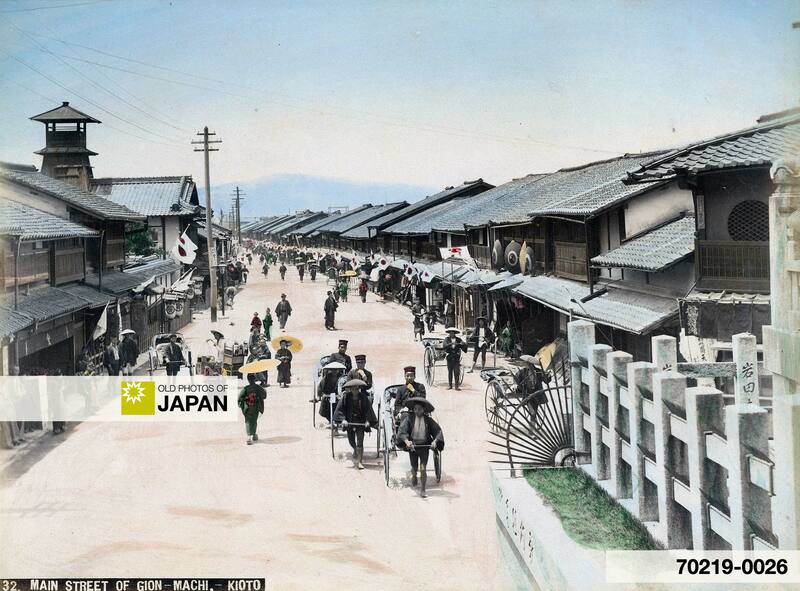 But in 1874 (Meiji 7) it was widened to 9 meters. In 1912 (Taisho 1) it was once again widened, this time to 22 meters. This made it possible for streetcars to ply Shijo-dori. At the same time, Shijo Ohashi, the bridge which is located around the spot where the street on this image disappears, was also widened. Although the changes may have happened gradually, in the end they were quite drastic. When you stand on the steps of Yasaka Shrine today, you look at a completely different scene, dominated by noisy cars and concrete buildings instead of people and wood. A detail of the photo above shows rickshaws carrying soldiers, women in kimono carrying paper parasols, a vendor with his wares, men wearing Western hats, and curious children. No cars; streets still belonged to people. The rickshaws, the women in kimono with paper parasols and the traditional wooden architecture make this photo the quintessential image of traditional Japan. Kyoto’s Gion is these days considered to be one of the most traditional parts of one of Japan’s most traditional towns. But, at the time that this seemingly traditionally looking photo was taken, Kyoto was actually considered to be a modern town which experimented enthusiastically with modernization. Kyoto had the first experiments with film projection, the first public schools and the first hydro-electric power station. It was one of the first cities to run streetcars and develop an electricity network, and so on. Visionary leadership catapulted the city into the modern world setting an inspiring example to the rest of the country. The legacy of this foresight is still visible in the city’s excellent universities and highly competitive high-tech industry. Today Kyoto is the home of companies like Kyocera, Nintendo, Murata and Rohm and houses the largest agglomeration of IT companies outside Tokyo’s Shibuya. Although the city still nurtures many of Japan’s traditional crafts and occupations, Kyoto’s image as a traditional town with people who cling stubbornly to the past is clearly not completely true. Change is Kyoto’s tradition. Actually, this may be true for most of Japan. Highly respected scholar and translator Edward Seidensticker (1921-2007) said it very beautifully: “The relationship between tradition and change in Japan has always been complicated by the fact that change is in itself a tradition.” In Japan there is almost always a strong undercurrent of positive acceptance of change. Too bad that not all change is for the better. You can also licence this image online: 70219-0026 @ MeijiShowa.com. I suggest people zoom in all the way on the google map and set to satellite image. It is really interesting to see the street today versus what it looked like in the past. Thanks for the compliment, Tornadoes28. The difference is quite big, isn’t it. I hope to have a current photo taken from the same spot soon!